I'm a licensed psychologist and the director of the Jesse G. Harris, Jr. 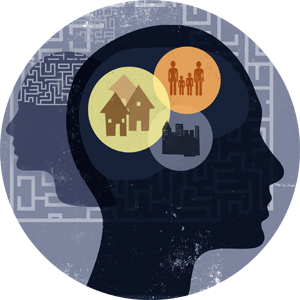 Psychological Services Center, the Department of Psychology's training center for graduate students in the PCSAS and APA-accredited clinical psychology Ph.D. program. I oversee the operations of the center and offer administrative and clinical supervision to the graduate students who are participating in 10 or 20-hour per week practicum placements as center coordinators. I also conduct psychotherapy supervision with selected graduate students who are providing adult and couples therapy. I serve as the faculty sponsor for selected Psychology majors enrolled in our center's PSY 399 and 499 undergraduate internship programs. In addition to my center duties, I'm the training director of the department's affiliated pre-doctoral health service psychology internship, the University of Kentucky Internship Consortium program. This program is accredited by the American Psychological Association. It includes 6 training sites for interns, including Eastern State Hospital, Cardinal Hill Rehabilitation Hospital, UK Counseling Center, UK Orofacial Pain Center, UK Adolescent Medicine Clinic and UK Center for the Advancement of Women's Health. My clinical and professional interests include mental health advocacy, program development and administration, clinical supervision, and management of behavioral emergencies. I worked for over 24 years at Eastern State Hospital, a public psychiatric hospital in Lexington, KY. My roles there included program director for the Admissions Unit, founding director of The Recovery Mall rehabilitation program, Ethics Committee chair and director of Psychology Services. As a past President of the Kentucky Psychological Association, I promote involvement in state psychological associations, and am active in advocacy initiatives at the state and Federal levels. I serve on the steering committee for Health Literacy Kentucky, which promotes health literacy awareness and education throughout the state. I'm currently the Kentucky representative (2014-19) to the American Psychological Association (APA) Council of Representatives and a member of the Council Leadership Team (2019-21). For applicants to our clinical psychology graduate program, please note that I don't run a research lab or serve as a research mentor. I work with all of our clinical psychology graduate students through their clinical training at the Harris Psychological Services Center. I also sponsor a graduate student advocacy group, which students may elect to participate in to learn more about mental health advocacy initiatives.